Arrivals Nice, Cote d’Azur airport. We will meet you at the airport at 3pm for transfer to your charming hotel in Sainte Maxime where you can take time to unpack, settle in or enjoy a swim in the pool. Late afternoon, we meet for a briefing meeting and we will take you through the itinerary with tips for the days to come and advice on camera settings. We meet after breakfast and set off in the RIB for St Tropez in advance of the race that starts at approximately 11am (depending on weather and wind) and we shoot from the RIB for the morning session. We will break for lunch when the yachts are at their furthest away from shore and we resume for another session in the afternoon as they approach the shore again and shoot until the end of the race. You will capture all the action from the RIB, expertly piloted by our skipper, Francois who, because of his sailing expertise, is always able to put us in just the right spot for the best shots. There are lots of craft on the water all jockeying for a good position, but Francois is skilled and experienced and knows exactly what’s about to happen next and makes sure we get there first! You will get plenty of close-up action shots of the crews up the masts, raising and bringing down the spinnaker & sails and working during their manoeuvres but you will also capture stunning landscape shots from a distance. During your 4 days on the water, you will cover most of the fleet from the smallest to the biggest yachts as they leave the harbour, during the regatta and as we follow them back to the harbour at the end of the day. We return to the hotel to download your pictures and will meet for a review/critique session (time permitting) to ensure everyone is happy with their settings and confident ahead of the second days’ shooting. We set off early for the sunrise shoot. After the shoot, we have breakfast in Saint Tropez and you can capture atmospheric pre-race ‘street photography’ as the crews wake up and the harbour comes to life. 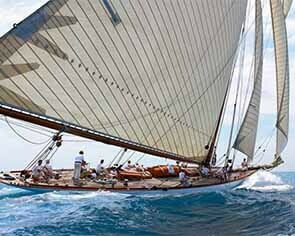 Today on the water is the challenge day of the Regatta for both traditional and modern yachts. This is where two yachts in the same category can challenge each other to a two-boat race. In the afternoon we return to the hotel and will meet for a review/critique session (time permitting). We set off to capture the race with both traditional and modern yachts. After the race, we capture some atmospheric photos as the boats return to the harbour. Fantastic for ‘people’ shots and ‘street photography’ in the post-race buzz. We enjoy an aperitif at one of the famous harbour-side cafes, soaking up the atmosphere, before enjoying dinner at a charming bistro in Saint Tropez, returning to the hotel after dinner. We set off for an early start, so we can reach the Wally boats racing – furthest out from the harbour, before returning to the main regatta later in the day. We return to the hotel to download your photos and for a final review/critique session. We meet for an aperitif at the hotel before setting off for the group closing dinner (optional). After breakfast, transfer to Nice airport, arriving around 12h00, for your afternoon flight home. Discounts available for group bookings. Please enquire to find out more. This workshop requires a minimum number of 4 participants to be able to go ahead. To join this workshop, you need to have a good understanding of how your own camera works (how to set it up in Manual, Aperture and Shutter priority) and understand about exposure.